Would you post a selfie on Twitter or Facebook with your credit card, for the whole world to see? Fans taking ticket selfies are doing little different, and the result is ticket theft. The moment is a special one. Your fans have clinched their tickets to a big game or a once-in-a-lifetime performance by their favorite artist. They’re often so excited that they can’t wait to show off their good fortune to their friends by capturing the moment with a ticket selfie (a photo of themselves with their tickets), captioning it with a hashtag or two (#excited) and posting it to their personal social media channels. Ticket selfies are posted in good fun and spirit, until things take a drastic turn for the worse. And the issue has to do with the ticket barcode. 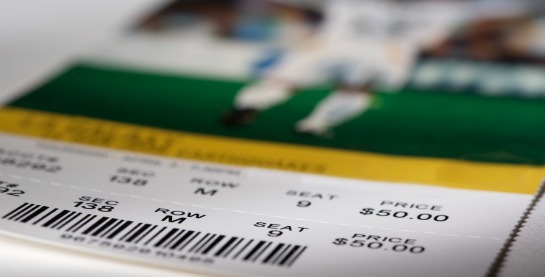 If the wrong people get their hands on images of fans’ tickets, they can easily copy the legally-acquired tickets and slap exact same barcodes onto their own homemade versions. Scammers can then develop multiple fake tickets, selling them to dozens of other innocent fans online or on the streets. The situation happens more than you think, and both paper tickets and e-tickets are susceptible to being stolen and counterfeited. According to the AARP, nearly five million consumers pay for and receive fraudulent concert, sporting event and theme park tickets every year, which costs the live entertainment industry an average of $4 million per month. All of the fans involved in these incidents suffer, especially if they get shut out of their highly-anticipated event. And while ticket fraud may not make up a huge percentage of your team or venue’s transactions, you’ll certainly have a more difficult time winning back fans’ trust and, by extension, their business in the future. You can encourage fans to exercise caution when posting ticket selfies to social media as a quick fix; however, you need a long-term solution for battling the ticket fraud issue. The strongest alternative for you to consider is to eliminate paper or e-ticket methods of ticket delivery and entry altogether and issue digital tickets that are tied to a person’s ID (mobile app, credit cards or driver’s license). Digital ticketing is not a new concept to consumers. Many airline travelers buy their tickets online with a credit card and can use their cards to check in at airport kiosks. Similarly, venues that utilize a digital ticketing solution, such as Flash Seats®, enable fans who purchase event tickets online to enter venues by swiping their elected form of ID. The fan’s ID is the key. Fans who buy Flash Seats get digital tickets delivered directly to their account. At the event, fans use their ID as the key to access those tickets — instead of using a paper or print-at-home tickets with a barcode that can be stolen. And a Flash Seats ID can be either the mobile app or the credit card they used to purchase the tickets. Hence, their designated ID gives fans access to the digital tickets in their account, not a ticket barcode. Transfer without hassle. With e-tickets, fans who purchase group tickets often forward them to their friends, who may also post their own ticket selfies. With Flash Seats, fans can transfer tickets to friends through their online Flash Seats accounts. Their friends will receive an email, prompting them to create their own Flash Seats account and register a form of ID to enter the event. In addition to mitigating the ticket selfie issue, the original purchaser of the tickets doesn’t have to drop off tickets at will call or wait for friends to show up to an event to enter. Everyone in the group can enter at their leisure — using their favorite ID — the Flash Seats mobile app, credit card or license. Selfies made safe. The fans who love taking selfies with their event tickets can still do so safely at events using Flash Seats. They can take a picture of themselves with their Flash Seats mobile ID, which rotates every 60 seconds, to show off the tickets they just scored. Even if someone tries to steal an image of the mobile ID, it will not be authenticated at the venue. Additionally, when they enter the venue, fans will receive a paper seat locator that includes info on the event and where they are seated. It resembles a paper ticket and is perfect for an at-event ticket selfie. You can continue to warn fans about the perils of ticket selfies, but before you rain on their parade, consider alternative opportunities that will help you eliminate fraud across the board and improve your bottom line.